Not sure how many are aware except for the locals, but Lake Shore Drive for some reason continues to employ two street lights at Chestnut and Chicago Aves. These two alone are probably the biggest reasons why there is a major backup southbound every afternoon from Belmont to this point (although two smaller issues would be the Michigan Ave split and the S-Curve), and northbound as a continuation of the Grant Park backups. How much longer do you think these lights are gonna be employed? You could honestly just barricade those two entrances off and turn off the lights until an eventual rebuild is deployed. IDOT and CDOT are working on a plan to rebuild North LSD, and removing the traffic signals at Chicago will likely be in the recommended plan. Doubtful you will see anything happen before they do the big project. I'd have expected the signals at Jackson and Monroe to be the bigger PITA than at Chicago. I recall the signal at Monroe having a painfully long NB left turn phase, even on the weekends. Though those two are a royal PITA, the ones at Chestnut/Chicago are worse by virtue of the fact that they are so close to the curve. 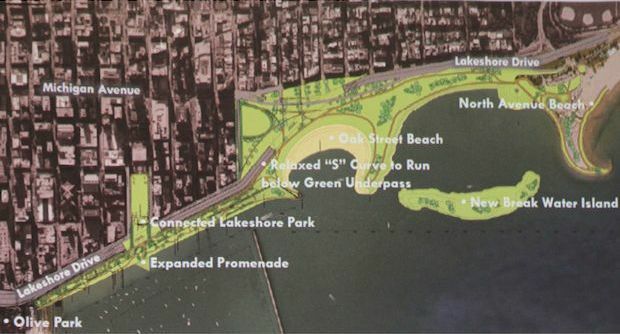 I looked over the new LSD plan, though I can't remember where I saw it, and I think it has a lot of great potential, plus the addition of the parkland that would come from it would be great (though we'd have to endure probably at least a couple summers with some construction through there for the time being while it was being done). The problem with getting rid of the light at Chicago Ave is that it is a direct connection to Northwestern Hospital instead of exiting at Illinois/Grand (wait for those LONG lights), go 2 blocks west to Fairbanks and then north 4 blocks to the hospital. As long as NWern & Lurie Children's are major hospitals, that direct access will not be cut off. 1) The Lake Shore Dr tunnels starts at Goethe St, swings into the lake at Division St at about a 30 degree angle, then swings back on at Superior St at about a 20 degree angle and ends at Huron St. This allows the tunnels to have a 45 mph zone through the entire focus zone. 2) New tunnel ramps to/from the Lake Shore Dr tunnel are a half interchange to/from north at Walton Pl and to/from south at Superior St that connect directly to current Lake Shore Dr.
3) Access to Chicago Ave and Chestnut St is full access. 4) Inner Lake Shore Dr becomes a one way street heading east/south from Michigan Ave to Superior St. South of Superior to Ontario St remains a 2 way street. South of Ontario it is a one way north street. 5) Access to Ontario St from the current Lake Shore Dr (old section of LSD that is converted to a 2 lane each way boulevard) from near Erie St moves to just south of Chicago Ave.
6) Access to/from Michigan Ave is moved slightly north of the current ramps. 7) Access to Illinois St/Grand Ave, Wacker Dr & Randolph St does not change at all. By doing it this way, you open up more of the Lakefront Trail and Oak St Beach access while fixing the issues around the S curve and the stoplights. I can go for that. However, given that numerous proposals to make LSD full expressway/freeway (remember I-494/I-694?) have been shot down in the past, I don't see this as an easy sell, much less a fix. I saw this proposition brought up a few years ago. I'm all for building out into the lake to smooth out that curve! I am all for bringing LSD closer to Interstate-standard in any way that isn't needlessly destructive.